A friend warned me that if our family spent a weekend at Alisal Guest Ranch and Resort, we’d end up booking our next trip before we even left the property. 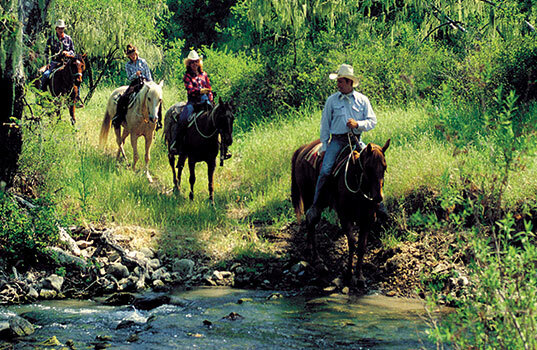 Nestled in the scenic rolling hills of the lush Santa Ynez Valley, Alisal is a full-service 10,000-acre, all-inclusive resort/dude ranch experience that combines the elegance and comfort of the western lifestyle with a working cattle ranch where 2,000 head of cattle and 100-quarter horses leisurely graze. 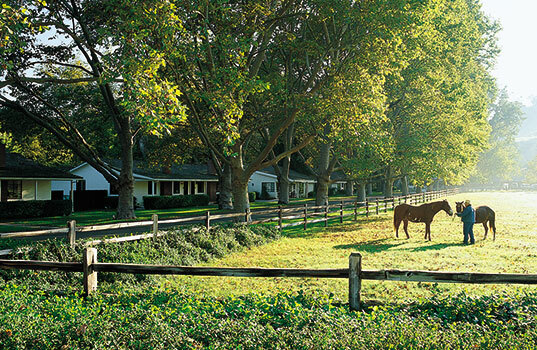 Beautifully manicured lawns characterize the grounds of the main “resort” – connecting 73 California ranch-style cottage studios and suites to restaurants and recreational facilities. Since 1843 when conquistador Raimundo Carrillo received a land grant and became the first cattle rancher of the Santa Ynez Valley, the Alisal (meaning “grove of sycamores” in Chumash, a Native American language) established itself as a working cattle ranch. 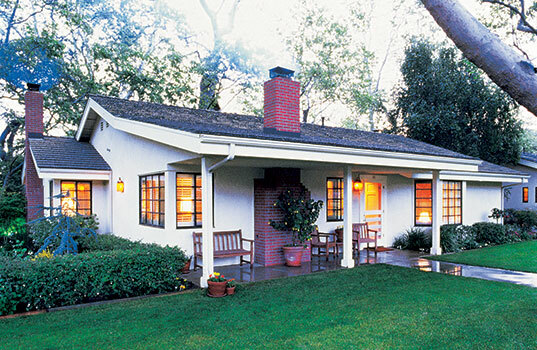 In 1943, the property was purchased by The Jackson Family and evolved into a guest ranch. The exclusive hideaway opened its doors to summer vacationers with 30 initial guestrooms converted into bungalows. The Alisal’s rich heritage and idyllic setting make it a haven for rest and relaxation and one of American’s most prestigious properties boasting a well preserved civilized past. Couples honeymoon here, families enjoy reunions and executives find a welcome respite from urban life. In our case, we were looking for a brief respite from the day-to-day without having to travel too far from home. While Alisal is only a three to four hour drive from Orange County, it feels worlds away – the property is blessed with an abundance of wildlife and hiking trails meander around the resort’s rich flora and fauna (nature lovers can take a self-guided hike through Deer Canyon where some 64 different animals including deer, possums, bobcats, mountain lions, wild boar and black bears reside). Back at the ranch, children as well as adults can participate in the caring of the ponies, bottle-feeding the goats, calves, exotic miniature horses and sheep seven days a week at The Alisal Barn Yard. Because our kids (ages 8 and 9) were to be first-time horseback riders up to the historic Adobe Camp for pancake breakfast the morning after our arrival, we “practiced” riding around a corral atop a gentle horse that spends a few hours each day tethered to a tree so the resort’s youngest guests can have their parents lead them around the corral at their leisure). 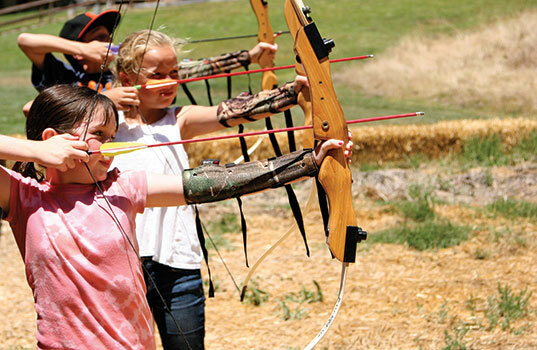 Kids can also participate in egg gathering, grooming and exercising the animals in the corral. A recreation center unto itself, the 100-acre spring fed Alisal Lake, filled with bass; trout; and bluegill, offers “catch-and-release” fishing. You can rent a boat or fish off the dock – our son caught his first fish (a Bigmouth Bass reeled in with Daddy’s help) by casting (also with Daddy’s help) from the dock. This sportsman’s paradise attracts bird watchers and guests with canoes, rowboats, peddle boats, kayaks or sail boats. 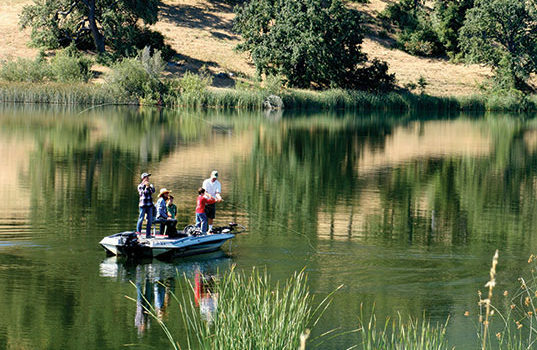 As one of two California properties to be an Orvis-endorsed fly-fishing operation, Alisal offers fly-fishing and boating lessons for children and adults. Visitors rarely leave the Alisal during their stay and for good reason. Leaving at dawn, guests enjoy more than 50 miles of equestrian trails on horseback circling the magnificent hills and sycamore groves. Twice daily group rides, private rides and breakfast rides to the historicAdobe Camp round out a stay. Aspiring equestrians can hone their riding skills at the corral with private lessons. Children delight in the Alisal Rodeo with stick horse and gunny sack races and boot relays in an authentic western arena. Wranglers show off with quick draw demonstrations, calf roping and barrel racing. Following the rodeo is an extravagant western barbecue with live entertainment and traditional line dancing. For those seeking more civilized pursuits, two 18-hole championship golf courses – the par 72, 6,500-yard Ranch Course and the par 72, 6,800-yard River Course with four lakes – provide impeccably manicured fairways and greens with spectacular views of the Santa Ynez River and nearby Santa Ynez Mountains. A full range of facilities and services are offered at both courses including a clubhouse, driving range, putting green and pro shop. Private and group lessons by PGA and LPGA professionals are also available. A full-service Tennis Center with a well-equipped pro tennis shop is situated on a scenic area of the Ranch. Tennis buffs can choose from seven hard courts. Tennis professionals, one of whom is nationally ranked, offer both clinics and private lessons by appointment. After a lengthy day of horseback riding, the Alisal’s outdoor heated swimming pool and adjacent eight-seat spa are the perfect way to unwind. The Ranch Room, the resort’s restaurant, serves American and western style favorites. Guests enjoy a choice of a hearty a la carte American breakfast menu items that include Linguisa scrambled eggs over a Grilled Portobello Mushroom, savory Huevos Rancheros and the Alisal’s own Buttermilk Pancakes. A lavish Ranch Room breakfast buffet of Eggs Benedict and Corn Beef Hash is also served with freshly squeezed orange juice and homemade baked muffins, pastries and breads. Dinner is formal (dinner jackets are required for the men – and a great excuse to get gussied up for the girls) and frontier-size portions of juicy barbecued steaks, tender prime rib of beef and the fresh catch of the day including swordfish, John Dory and Seabass are guest favorites. Specialty dishes such as Osso Bucco, Hickory Smoked Briskett and slow roasted Farm Raised Wild Boar are prepared with the freshest ingredients for the guests’ dining pleasure. The Alisal features a Modified American Plan. Menus are rotated seven days a week, year round. 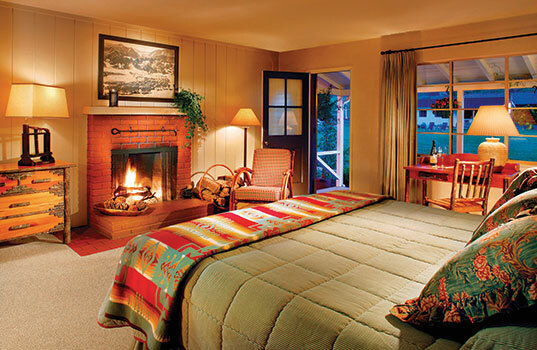 At the historic Adobe Camp, the resort treats guests to a full ranch breakfast including buttermilk flapjacks, scramble eggs, bacon, sausage, ham and more complete with a whimsical performance by Jake Copass, resident wrangler and cowboy poet, accompanied by Dave Stamey, the Alisal’s award-winning singing cowboy on guitar. Alisal’s 73 guest units are decorated in classic California ranch design and configured as either comfortable studios or spacious one-bedroom suites. Each unit, designed for maximum privacy and comfort, includes a wood-burning fireplace with complimentary firewood; high-beamed ceilings; Western art; refrigerator; coffee maker (coffee and tea supplied in rooms), and filtered water dispenser. To maintain the cozy, quiet atmosphere, there are no in-room televisions or telephones; however, complimentary wireless Internet is available throughout the ranch. For more info, call (800-4-ALISAL), e-mail reservations@alisal.com or visit www.alisal.com.